Water security. For me that means we could use as much water as we want to irrigate our food crops, even in the middle of a drought. For me, that means a significantly sized source of potable water to use in an emergency. And for me, that means harvesting rainwater. 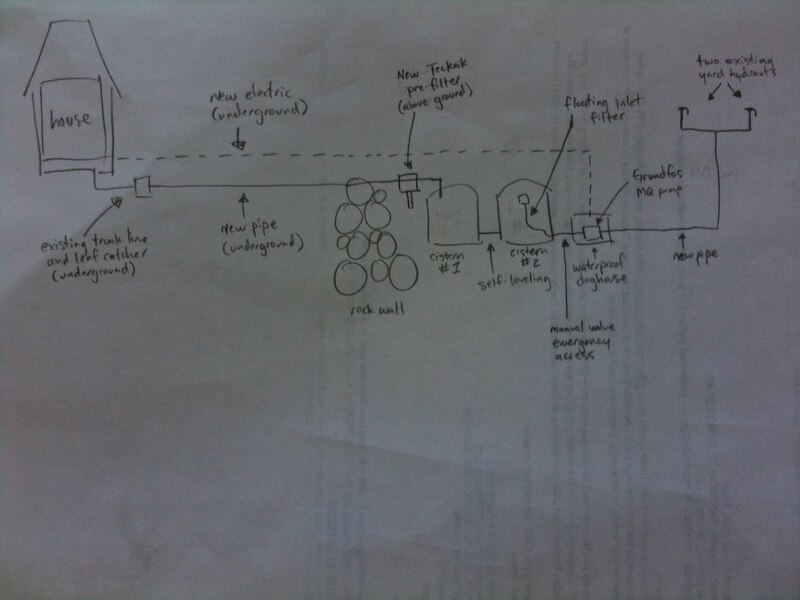 The nearby sketch shows the setup we built over the past three weeks. We’re harvesting rainwater from the roof gutters, into a “trash can” silt catcher, through to a 3P Technik VF1 Volume Filter, past a 4″ first flush diverter, and then into a pair of 2500 gallon cisterns. Extra rainfall can be diverted into an existing large diffuser once the tanks are full. Water then passes through a Graf floating inlet filter with 8’’ hose to be pumped back up our hill out of the tanks with a new Grundfos MQ 3-45 1HP 110v pump, feeding the two yard hydrants near the food forest and one yard hydrant near the house. From sketch to completion…look in this slideshow for more photos. This water storage book – although quite short – was by far the most useful. I could not find several components locally, so I ordered them from Rain Harvest.